This Bouncer lets little ones bounce safely anywhere, and is great for developing motor skills, coordination, and most importantly, having a lot of fun! The entire bounce area is enclosed by safety netting, and is ideal for 1-2 kids under the age of 5. This item fits easily in small spaces, thanks to its compact design. Add optional play balls, and this bouncer easily becomes a ball pit. 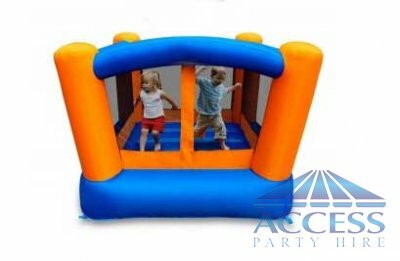 This Bouncer uses continuous airflow, and X-Weave materials, making it bouncier and longer-lasting than cheap blow-up PVC inflatable toys. This Bouncer is our most compact bouncer, and is extremely easy to set up and move. This bouncer inflates in under 1 minute! Please note that while this item may be durable enough to handle larger kids, the fan is not designed to support kids beyond the recommended limits. Jumping Castle suitable for the kids 3 to 5 years old. Now you can hire Little Jumping Castle for only $120.00 over the weekend !! !